January 1, 2002- Champaign, IL - Symbolic Sound Corporation has added a new family of sound synthesis techniques known collectively as "Aggregate Synthesis" to the large collection of sound synthesis and processing modules already available in their Kyma sound design workstation. In Aggregate Synthesis, complex timbres are constructed using banks of simpler elements. Most people are already familiar with one form of Aggregate Synthesis: the classic "additive synthesis" in which hundreds of sine wave oscillators are combined to create complex, evolving timbres. Symbolic Sound has extended that technique to include banks of other sound generating elements such as filters, grain clouds, and synthesized impulse responses. Aggregate Synthesis algorithms can be used to resynthesize a live or recorded spectrum or to generate purely synthetic spectra. FilterBank  A bank of bandpass filters, each controlled by a center frequency and amplitude envelope with the additional parameter of bandwidth. (In this MP3 example, you hear a spectral analysis of a voice resynthesized through the FilterBank with extreme time-stretching. The bandwidth is controlled by the VoicedUnvoiced module). Aggregate Synthesis modules are controlled by the same SpectrumSource modules that control the Additive Synthesis modules in Kyma. This means that Aggregate Synthesis can be used to resynthesize a live audio input or pre-analyzed spectra stored on disk. By supplying an array of amplitude and frequency values, you can also generate purely synthetic Aggregate Synthesis spectra. New kinds of noise for adding jitter to parameters  By adding a little jitter to parameters, you can make your sounds more lively and less static. But uniform random white noise can, itself, start to sound a little static and boring. The new "HotPink Noise" module has more structure to its randomness: small changes happen often, medium changes happen less often, and large changes happen even less often. For example, if you use HotPink Noise to control a parameter such as pitch, you will hear lots of small changes (like vibrato), some medium-sized changes (like pitch sequences), and every once in a while you hear a large change (like a transposition to a new tonal center). There is another structured source of jitter that you can use in Kyma 5.2: an expression that gives you a new chaotic number each time you trigger it. This expression uses the famous "interval of the map" in which the "orbits" of individual values exhibit behavior ranging from simple repeating cycles, to almost-but-not-quite repeating cycles, to chaos. New modules for extracting individual partials from a spectrum  Kyma users will appreciate a new set of modules that make it easy to extract specific amplitude or frequency tracks out of a spectrum and also let you track the fundamental or the voiced/unvoiced envelopes of a harmonic spectrum for use as control signals. New waveshaper whose shaping function can be altered while it is processing the input  The InputOutputCharacteristic lets you specify audio-rate input values and their corresponding output values. This module can be used in a wide range of applications including dynamic compression, waveform modulation, timbre waveshaping, distortion, sieves to restrict the allowable random values, and other forms of input to output warping. Aggregate Synthesis defines a whole new category of rich and lively timbres that can range from the highly realistic to the completely bizarre. Because Aggregate Synthesis is based on real world samples, it shares the liveliness and infinite variety of sampling. 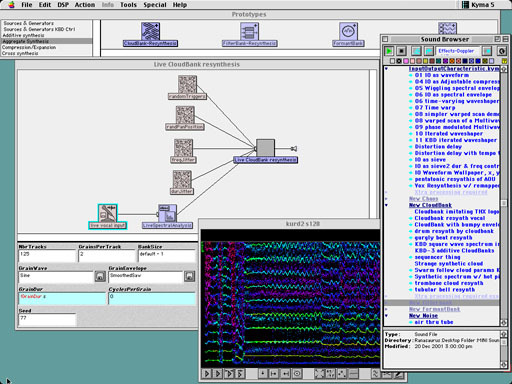 But because it uses alternate generators to independently resynthesize each partial of the spectrum, it gives you additional parameters that you can't get from sampling: the FilterBank gives you a bandwidth (like a "fuzziness" control in graphics); the FormantBank gives you independent control over the fundamental and formant frequencies (like size-warping in the graphics world); and the CloudBank gives you control over density, grain size, the rate of triggering and the jitter  analogous to being able to "pixelate" an image. Sound designers, composers, and remixers can use these algorithms for realistic resynthesis that degenerates into special effects or to resynthesize tracks as grain clouds or bandpass filters in order to warp them in multiple dimensions. Thanks to Kyma's dedicated sound computation engine, performers can also use Aggregate Synthesis live on stage to process their instruments and voices. Two-time winner of the Electronic Musician magazine Editors' Choice Award (2001 and 1998) and featured in the March 1998 Wall Street Journal Entertainment Technology insert, Kyma is a modular, software-based audio synthesis and processing environment accelerated by DSP hardware. 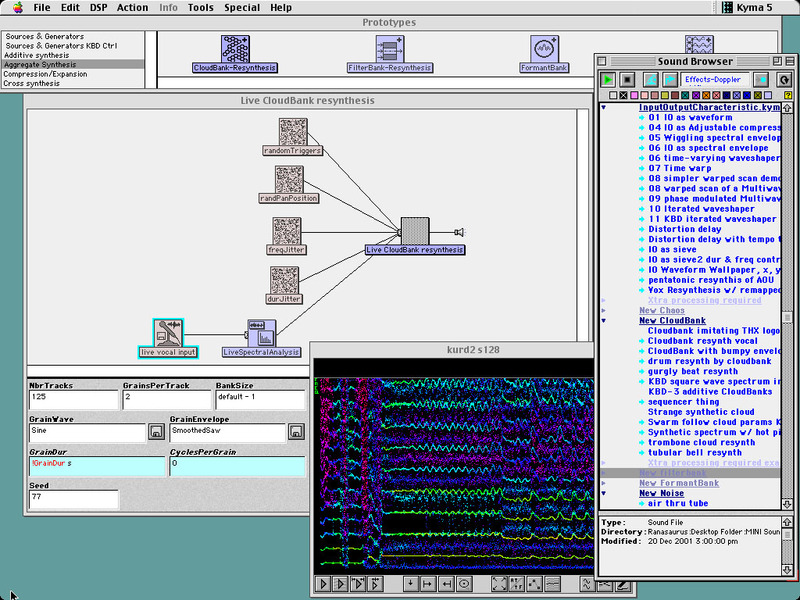 Sound designers use a graphical signal flow editor on the screen of either a Macintosh or PC to specify how to synthesize and process the sound. The signal flow diagram is turned into a program for the multiple-DSP Capybara hardware (which connects to the host computer via Firewire, PCI, NuBus, ISA, or PCMCIA card). Kyma provides modules for granular synthesis, sample granulation, analog-style synthesis and sequencing, cross-synthesis, alternate tunings, true spectral morphing (not to be confused with crossfading), highly intelligible vocoding, live spectral analysis & resynthesis, cross-synthesis, additive synthesis (synthetic spectra or spectra from analysis), Shepard's tones (the endlessly rising glissando illusion), and more. (For additional information see www.symbolicsound.com). The Capybara-320 Sound Computation Engine is a multi-processor hardware accelerator for the Kyma software sound design environment. The Capybara 320 provides a minimum of four DSPs (expandable to 28) with multi-channel I/O, synchronization to external clocks, and 96 MB of sample RAM (expandable to 672 Mb) in a low-noise, rack-mountable package connected to a desktop or laptop Macintosh or Windows PC. For up-to-the minute Kyma user news, visit the Eighth Nerve online newsletter. The Symbolic Sound Corporation designs, produces, and markets hardware and software for digital audio. The first Kyma system was delivered in January 1991, and since that time, there have been 5 major software upgrades, 5 hardware upgrades and ports from the original 680xx Macintosh platform to Windows machines, PowerMacs and to laptop PCs and Macintoshes. Aggregate Synthesis  a powerful new family of sound synthesis and processing techniques for generating complex, dynamic timbres and soundscapes.